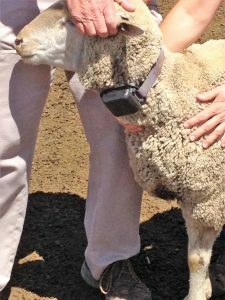 A South African farmer is already using the transponders on her sheep. Dr. Thomas Terrill, a Fort Valley State University associate professor of animal science, recently traveled to South Africa for three weeks after receiving his first assignment as a Fulbright Specialist. Collaborating with national experts, Terrill assisted in the development of a new system that allows farmers to use their cellphones to access a decision support system for needed information to keep their animals healthy and to help grow their crops. He also spoke at a conference in Cape Town and at the University of Pretoria. “The main part of the trip was to develop a team of scientists who are willing to seek additional funding and to identify the missing pieces so we can move forward,” Terrill said. He explained that there are several different components needed for the system to work, including a modeler and someone to develop the model and input the data for farmers to have access to the information. Now with a team organized, Terrill said they also collaborated with a small company called AcciTrack in Cape Town. The company developed a transponder that will hang around an animal’s neck. A field device will collect the signal from the transponder and send it to a centralized computer. In addition, Terrill said farmers will have access to expert decision support. “What this is allowing them to do is basically have a veterinarian in their pocket,” he said. “It’s a way for farmers to access expert information without someone having to go out and do it for them.” He noted most of the farmers in South Africa have cellphones and are familiar with them. Terrill said parts of the system are already working. He and his team met with a South African farmer who is utilizing the transponders on her sheep. As the system grows, more components can be added. He is working with a group of researchers, farmers and specialists to continue developing the system. This team includes the University of Pretoria in South Africa and a computer modeler from the University of North Georgia (UNG), Gainesville campus, in addition to colleagues at the University in Bristol in England and Queen’s University of Belfast in Ireland. The Fulbright Specialist Program, established in 2001 by the U.S. Department of State, Bureau of Educational and Cultural Affairs (ECA), pairs highly qualified U.S. academics and professionals with host institutions abroad to share their expertise and to learn about other cultures while building capacity at their overseas host institutions.